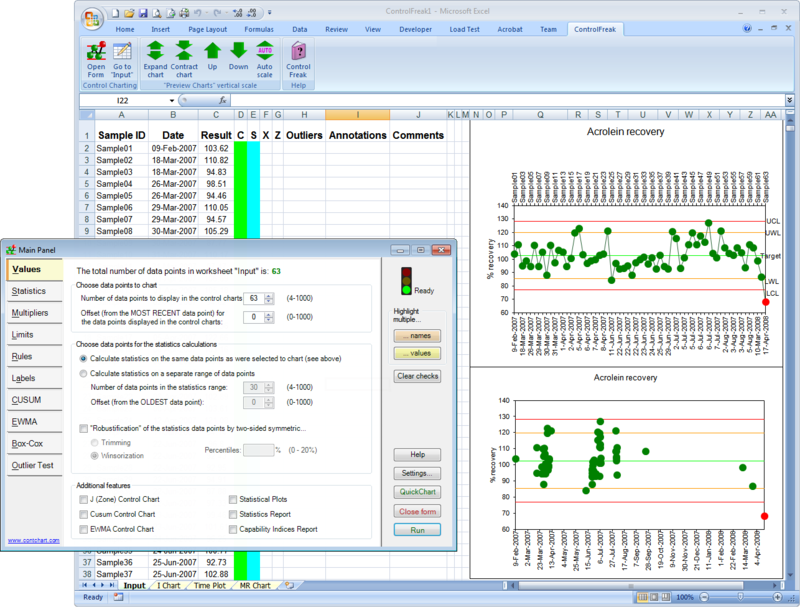 ControlFreak is an application for control charting of individual data points. It is designed to be easy to use, to provide an exhaustive set of control charts, and to offer many tools that will give you full control of all charting and calculation details. Enter your data into ControlFreak and click a single button to run a quick and dirty Shewhart control chart. Click a few other buttons to run advanced EWMA control charts for location and scale. Fine tune the control chart sensitivity versus the false alarm rate. Use ControlFreak's data selection tools to be sure that the control charting and the statistics are done with the desired data points. Check your data for goodness-of-fit and for autocorrelation. Follow up by calculating capability indices with confidence intervals. Finish by printing a detailed report. Control charting is best done by those who know the process and work with it every day. They have the knowledge and experience to fix issues whenever anything goes wrong. ControlFreak can help them to take action before it goes wrong. Why do you need control charting?